Please forgive me Derek Fisher for all of those glue factory wise cracks that I laid upon your play in the first three playoff series. You shut me up with 2 legendary threes last night in the Lakers thrilling OT win to take a 3-1 series leader. 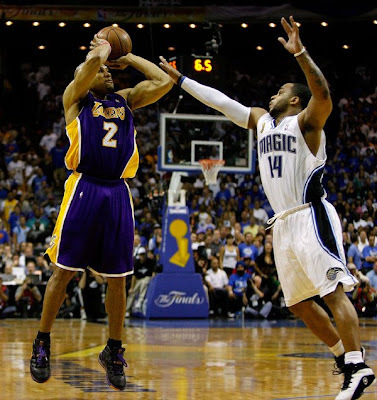 Orlando blew a huge opportunity to make this a best of 3 with huge Free Throw misses by Dwight Howard but now, it is just matter of when the Lakers are crowned champs. I have no idea what Jameer Nelson was doing on this play but he should have tackled Fisher much earlier.